Solution: The temperature of an object increases by 42.4°C when it absorbs 3833 J of heat. Calculate the heat of the object. The mass of the object is 377 g.Use this table of specific heats to identify the object. The temperature of an object increases by 42.4°C when it absorbs 3833 J of heat. Calculate the heat of the object. 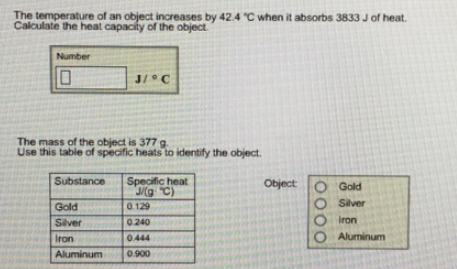 The mass of the object is 377 g.
Use this table of specific heats to identify the object.